Costco has been growing steadily for decades - producing strong shareholder returns in the process. The company has paid dividends - and sometimes special dividends - since 2004. Expect the Board to announce a 10-12% dividend hike in late April. The stock is just too expensive here - sell before the multiple contracts. Costco (NASDAQ:COST) is probably well-known for most consumers looking for a good deal. However, the company is not as well-covered in the dividend investing community. A reason for that is probably the unimpressive dividend yield, which currently sits at just under 1%. 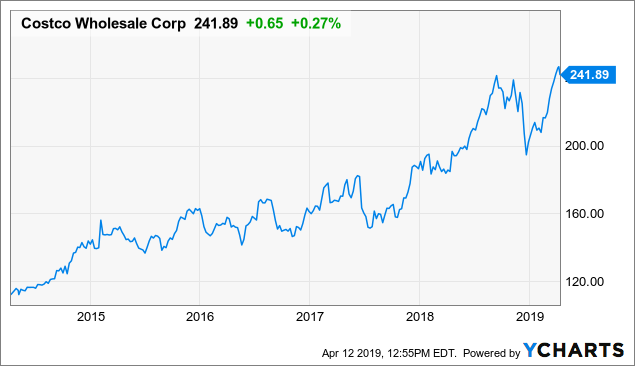 Still, for long-term investors looking to grow their income over time as opposed to maximizing current income, the historically high dividend growth rate should earn this stock a place on the watch list. Sadly, though, this nice dividend streak is more than priced into the stock at this time, making it just too expensive for new investors looking to add the stock. Over the last five years, shareholders have enjoyed a stock that has appreciated from approximately $100 to the current level of $242 for a total gain of 142% or an average annual return of more than 19%. Adding in the approximate yield of 1% over the period, we arrive at a total shareholder return of more than 20%. In addition to this, investors have received some nice special dividends along the way. More than 20% annually from a stable, and many would say boring, stock operating in a fiercely competitive market is nothing short of impressive. Costco has been growing its business aggressively for decades on end. Since 2004, it has also grown its dividend at a very respectable rate. In May 2004, Costco paid its first quarterly dividend of $0.10 per share. Since then, it has grown steadily year by year until it was hiked last year to $0.57 per share. This translates into an average annual growth rate of a full 13%. Last year, the dividend was hiked by 14% while it was hiked by 11% the year before. Sustaining double-digit dividend growth for such a long time is quite impressive. What's more, the company irregularly pays out extraordinary dividends. In 2012, it paid $7 in special dividend; in 2015, it paid $5; and in 2017, it paid $7 in special dividend. To say that the company is shareholder friendly is an understatement. Naturally, because of the special dividends, the chart above looks a bit messy. What we do see, however, is that the dividend is increasing steadily over time with bumps every now and then when the special dividend is paid out. The payout ratio trend is a bit hard to discern. When special dividends are paid out, it jumps above 100% but quickly falls down again to between 20% and 30%. Last fiscal year the company earned $7.09 per share. Using the current annualized payout of $2.28, we end up with a payout ratio of 32%. Paying out a third of earnings seems very conservative to me. 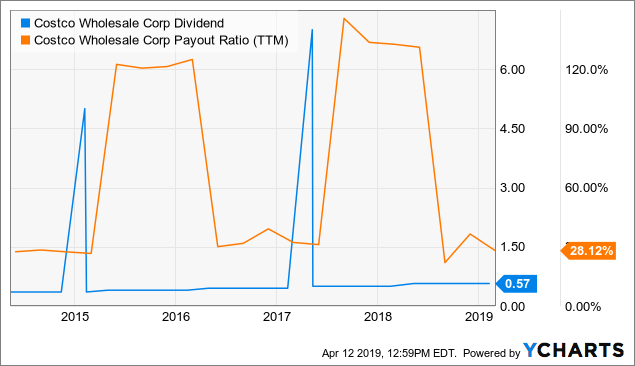 Such a low payout ratio means the company can continue increasing the dividend for many years - even with low or non-existent earnings growth. The dividend is definitely very safe and investors need not worry about the dividend not being raised. Ever since the dividend was introduced back in 2004, the new and higher dividend has been announced in late April. So there will be no prize for predicting that the same will happen this year. In order to see what potential the company has to increase its dividend, we'll take a look at its latest earnings report, released in early March. Things are going quite well, with sales for the first 24 weeks of the year up by 8.7% compared to the year before. Profit per share for the first 24 weeks came in at $3.74 compared to $3.04 the year before - that's an increase of a massive 23%. Considering the numbers above - namely the almost double-digit increase in sales and well into the double digits as EPS growth is concerned, I am quite comfortable that the Board will offer a decent dividend hike this year. Looking at its dividend history, we see that this company has never ever increased its dividend by less than 10%. The lowest dividend increase ever from this company was the 10.3% increase in 2008 from $0.145 to $0.16. I will therefore confidently say that the minimum increase this year will be of 10.5% to $0.63. That said, given the very conservative payout ratio and the fact that the business is doing so well, there is no reason to not offer something slightly better than minimum this year. Last year, it offered investors a 14% hike. Were that to happen this year, the dividend would increase to $0.65. We'll have to remember, though, that last year was a very good year in terms of earnings and that tax cuts helped boost earnings and dividends at many companies, not just at Costco. I therefore think the Board, in line with its conservative history, will go slightly lower this year. My prediction is therefore for a new quarterly dividend at Costco of $0.64 - representing a growth rate of 12%. If there is one thing the retail space has in abundance, it is risk. Amazon (NASDAQ:AMZN) is causing the death of many a retailer. The company is causing so much havoc it has even given a name to the death of brick-and-mortar stores - getting amazoned. There are arguments that low cost food and staples stores, like Costco, will be less affected given the nature of how people like to shop these things. Even so, it would be naïve to think it will not be impacted. Apart from Amazon, there is constant competition from the likes of Walmart (NYSE:WMT) and other low cost stores. Changing consumer trends, both as to what and how people like to shop, are also risks to consider in this space. With increasing urbanization, it is likely that city-dwellers will shop more locally rather than driving out of town to fill up their trunk with goods. Finally, cost pressures from both commodity price increases and wages are constantly threatening margins. No matter how well-run a company is and how fast it is growing, if you pay too much, returns will suffer. We're therefore going to look at how Costco is priced on some key metrics and compare it to two competitors - Walmart and Target (NYSE:TGT). We can see right away that all of them are trading quite similarly on Price/Sales. All have a ratio far below 1.0x. This is not surprising given the low-margin business these companies are operating in. On the Price/Earnings ratio, Walmart is clearly the most expensive one, just as Target is the clear winner with a downright cheap valuation of 14.5x. Costco is in the middle with the relatively high multiple of 31.0x. As for the dividend yield, Target is the winner again with a generous yield of 3.2%. Walmart is offering a yield in line with the overall market whereas Costco has a fairly low yield of just 1.0%. Keep in mind, though, that Costco offers a special dividend every now and then. The last special dividend was $7.0. If we assume they were to offer this on average every three years, the yield would be approximately 2.0% instead of 1.0%. Sadly, we have no guarantees they will do this, and therefore it's not prudent to take this into account. I would say Target seems quite cheap at these levels whereas Costco and Walmart both seem quite expensive. Analysts on Wall Street are expecting Costco to turn out an average annual EPS growth over the next five years of 10.7%. If we assume no change to the valuation multiple and add in the 1.0% dividend, we arrive at an expected annual total shareholder return of 11.7%. This is OK, slightly above what the market has historically offered. But the assumption of no downward pressure on the valuation multiple is just too optimistic in my view considering the intense competition this company is facing and that we are late in the economic cycle. Realistically, I therefore think returns will be considerably lower than what the overall market has delivered over time. If the valuation were to compress down to the earnings multiple of the overall market of approximately 20.0x, as represented by the S&P 500, average annual returns over the next five years would be just 2.3% annually. This tells us something about the importance of valuation but also how risky and detrimental it can be for long-term returns if we enter at a too high valuation multiple. Costco definitely offers high dividend growth, but the valuation multiple is too high for there to be a prospect for market-beating returns going forward. Remember, the market is forward looking, so if the multiple is to stay this high, the company must have just as good future growth prospects in five years as it has currently. As the market is saturated and getting ever more competitive, this seems unlikely. Costco has been growing steadily for decades, thereby producing strong shareholder returns for a long time. It has paid a predictably rising dividend ever since it was introduced in 2004 - and often special dividends to boot. It has never increased its dividend by less than 10% and this will not happen this year either. Later in April, the Board is likely to announce a 12% dividend hike for a new quarterly dividend of $0.64. Dividend growth is strong and here to stay for a long time. Sadly, this is not enough to produce strong returns going forward. The valuation is just too high to be conducive to high returns in the coming years. Investors should not be enticed by the high dividend growth - stay away from Costco until it gets significantly cheaper.